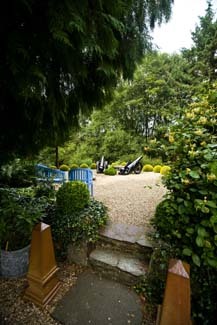 The garden at Kockanree reflects its creator Harold Clarke’s idea that one should never know what to expect around the next corner. 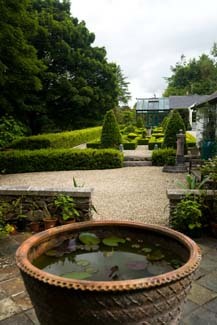 The garden at Kockanree reflects its creator Harold Clarke’s idea that one should never know what to expect around the next corner. And indeed it full of surprises, from the ‘Moonstone,’ a giant orb of granite like a miniature planet fallen to earth, to a family of Indian elephants, a laburnum tunnel raining gold, to Phoebe, forever reading her marble book in the shade of a sycamore tree. It would spoil the surprises to reveal more. 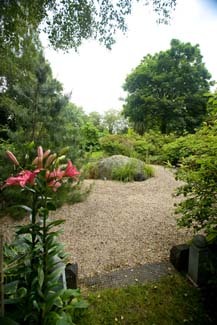 This is a garden to wander in, soothed by the plashing cascades of the Sulphur Brook at the foot of the slope which gives the garden its name and the pervasive sense harmony with nature. 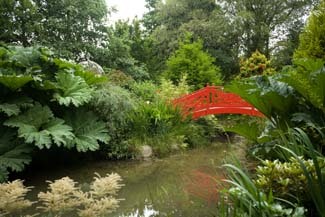 Trees from around the world have starring roles, among them, Embothrium coccineum the Chilean fire bush, Japanese umbrella trees, trees that provide a blaze of Autumn colour like Parrotia persica, Persian ironwood, Liquidamber and the swamp Cyprus Taxodium distichum. As you might expect from the only man in Ireland to receive a Thai lotus- growing bowl as a retirement gift, a strong oriental influence runs through. In the Zen circle, sheltered by an arc of azaleas, the central rock is carved with the traditional Kanji symbols “Snow, moon, flowers”. 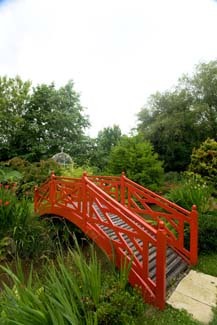 Across the lake an enticing island is reached by a Chinese bridge, its dramatic scarlet echoed by the flowers of Corosmia ‘Lucifer’ and swags of Tropaeolum. 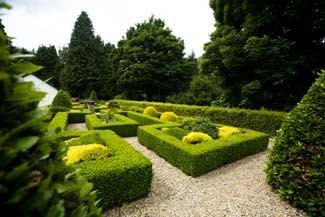 The terrace, where the parterre planted with well behaved golden, dwarf conifers, attracts a good deal of admiration and in the rose garden the knobbly knees of old fashioned beauties like R ‘Mme Isaac Pereire’ are thoughtfully concealed by a precision clipped hedge. 1.5km from Avoca on Redcross Road. Green gate on left after “Caution Children” sign.